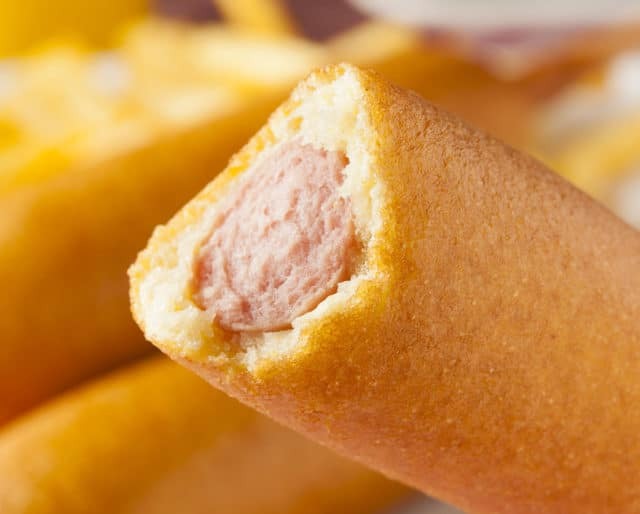 While the jury’s still out on knowing exactly who invented the corn dog, one thing is certain: It’s about as American as food items get. Cornmeal was a staple of the Native American diet, and hot dogs are an American adaptation of a German classic. The marriage of these ingredients led to the creation of an item that dominated a fair share of 20th century grab-and-go food sales, and in the process, became a cultural icon. On March 16, we celebrate the corn dog’s iconic status with National Corn Dog Day! Coney Island might not be the home of the first corn, but you can certainly find a lot of them here! Check out the pier for all of the hot dog stands. If they were difficult to make, they probably wouldn't be served at fairs. Making corn dogs is an easy process, and if you do it at home, you can have it your way. Mushroom swiss hot dog for the inside — why not? Corn dogs aren't just for fairs anymore! Check out your local holes-in-the-wall to see if they're hiding this American classic somewhere on their menu. The appeal of the corn dog crosses economic boundaries — rich or poor, you'll have a hard time finding a whole group of people who isn't down with the corn dog. It's practically a universal truth: if it can be eaten on a stick, it better be eaten on a stick. Salads have their place in the world, but when you're looking for something to stick to your ribs, corn dogs do the trick.